Whether you have a magnificent spiral staircase or a corridor between different areas of your home, hallways have always been appropriate places to add stained glass and leaded glass. Staircase windows will often be odd shapes, possibly arched at the top as in our photograph here so this makes the windows difficult to cover with traditional window coverings. The options are limited in terms of covering the glass, adding a design feature, privacy and at the same time allowing the light to come in. 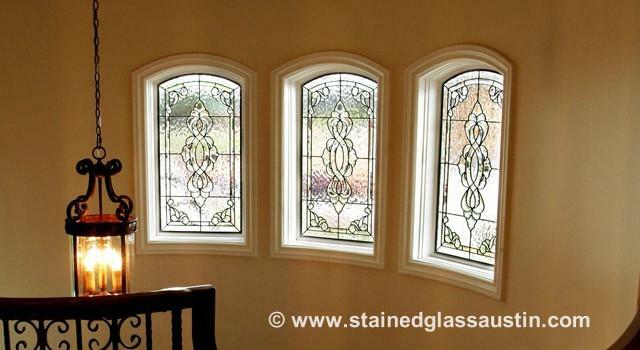 Stained or leaded glass is the only way to do all of these at the same time. Our stained glass is not only beautiful but also functional. Clients will often ask us whether we think a traditional design or a more contemporary design will look best in their hallway windows. While other areas of the home are usually more decorated with a definite theme the hallway is often left with only bare walls and no room for furniture. Stained glass adds the final touch to make this part of your home more interesting and allow you to integrate the interior design ideas being created in other rooms and carry these throughout your home. Our stained glass designer is always ready and willing to come to your home and offer free advice and design suggestions. Call or email us today to schedule your free consultation.